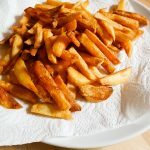 Popularised by Heston Blumenthal, triple-cooked chips (french fries for you North Americans) are very simple to make at home and not at all as faffy as they sound. 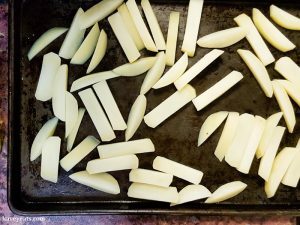 The first cooking is to parboil the chipped potatoes; the next is to fry the chips at a low-to-medium temperature and allow them to cool and dry; the third is to fry again at a higher temperature to finish. 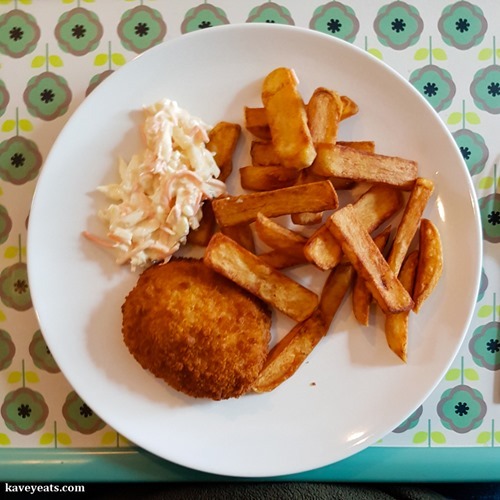 One of the handy aspects of this recipe is that it allows you to do the prep and first two stages of cooking in advance, so that you are left only with a quick hot fry to finish just before serving. Even without putting them in the freezer, following Heston’s method will result in very delicious chips indeed. Rather appropriately, we made our triple-cooked chips in the Smart Fryer designed by Heston Blumenthal for Sage Appliances. 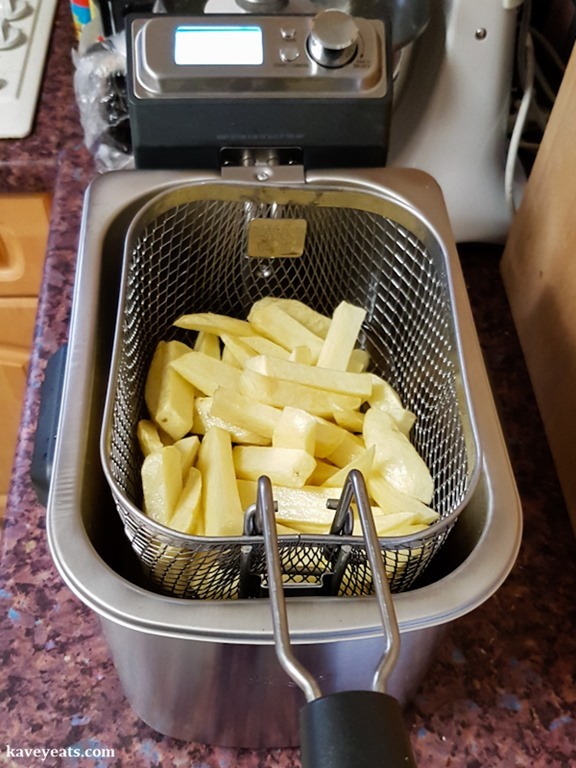 This is a fantastic step up from our last deep fat fryer which served us well for the last three years but is now falling apart, particularly the basket and the hinge of the lid. 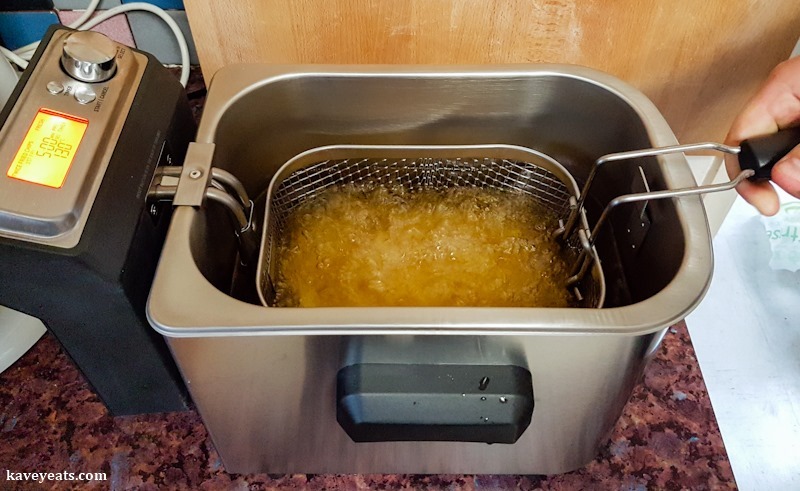 That was our first deep fat fryer and it was a great improvement over using a deep casserole dish on our gas hob. But it was heavy and unwieldy making it hard to empty the oil out of and a pain to clean. 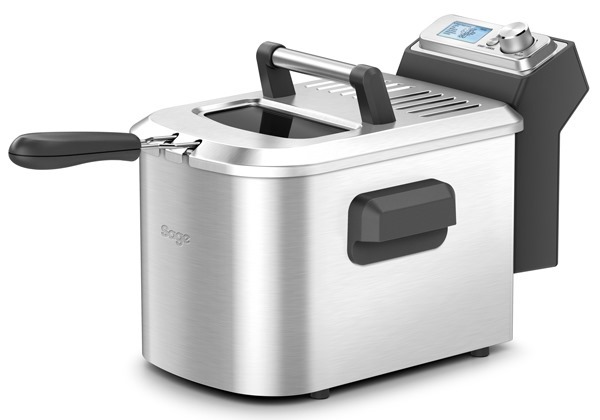 Our new Sage Smart Fryer has an ingenious design – the entire fryer separates into five components: a heating element and control panel unit, the exterior shell of the fryer, a removable inner well, the frying basket and the lid. With the exception of the element and control panel unit, all the other components are dishwasher safe, which is very handy for cleaning. Being able to remove the inner well of the fryer also makes it so much easier to pour out the 4 litres of oil that the fryer holds. Other helpful design aspects include a double-walled exterior shell for insulation, a viewing window in the lid and a foldable handle on the fryer basket so it can be stored inside the basket when not in use. In terms of cooking, you can set temperature and time manually in Custom mode or use one of the six preset Cook modes. These are Twice Fried Chips (that’s triple cooked chips in other words – the first cooking being the parboiling), Fish, Nuggets, Calamari, Doughnuts or (single fry) Chips. Choosing any of these Cook modes will display the preset time and temperature, which you can manually adjust if you wish. Once you’ve pressed the Start / Cancel button, just wait for the Heating message to disappear, then indicate whether you’re putting in Fresh or Frozen food, press the Timer button and lower the basket of food into the oil. When it’s finished, the fryer will beep. At this point you can either press the Timer and cook for an additional period, or press Start / Cancel to turn off the heating element. The Twice Fried Chips setting has an additional choice to make – whether you’re on the 1st Fry or the 2nd Fry. The Scroll / Select knob allows you to indicate this. 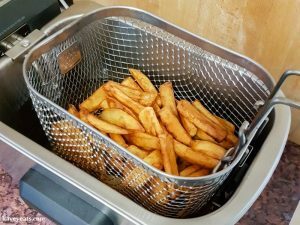 If you do not have a deep fat fryer you can fry the chips in a heavy-based casserole dish or pan on your hob, however you will need a thermometer to check the temperature of the oil. Heston recommends traditional floury varieties such as Maris Piper, Desiree or King Edward and suggests cutting the chips chunky – 2 cm x 2 cm thick – but smaller is also fine. Keep the peeled potatoes in a bowl of cold water as you work, and likewise with the chips as you cut them. This will stop browning on exposure to the air. The volume of oil needed depends on the capacity of your deep fat fryer. Mine is 4 litres. Place the chips into a large saucepan of cold water (making sure they are covered with water) and cook over a medium heat. Simmer until the chips are soft all the way through. Drain the chips and carefully spread them out on a cooling rack or baking tray to dry out. You can also place them into the freezer for an hour to remove more moisture, if you have space and time. Heat the oil in your deep-fat fryer to 130 °C. Once it reaches temperature, fry the chips (in batches if need be) until they take on a pale yellow colouring. This takes at least 5 minutes. Remove from the oil, drain and spread out to cool before the second frying. At this stage, if you don’t want to cook and serve the chips straight away you can refrigerate them for up to 3 days, if you wish. Now heat your oil to 180 °C. Once it reaches temperature, fry the chips until golden brown, around 5-7 minutes. Drain, sprinkle with salt and serve immediately. 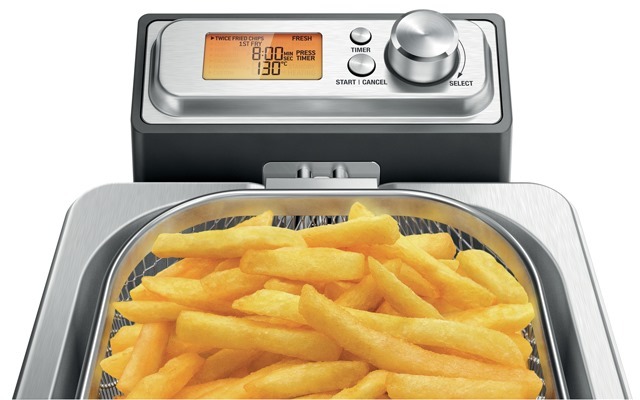 Note: If you are using the Smart Fryer’s Twice Fried setting, note that the recipe provided doesn’t include the parboiling stage, and therefore frying times are a little longer to cook the chips through to the centre. 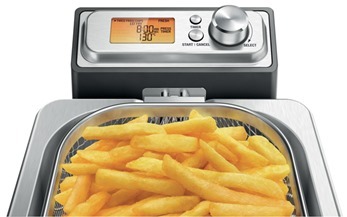 You can still use this mode to make Triple Cooked Chips but adjust the timer down by a couple of minutes for each fry. Kavey Eats received a Sage by Heston Blumenthal Smart Fryer for review. As always, I was not obliged to write a positive review; all opinions are my own and I recommend only products I truly believe in. This post contains affiliate links; please see my sidebar for further information. 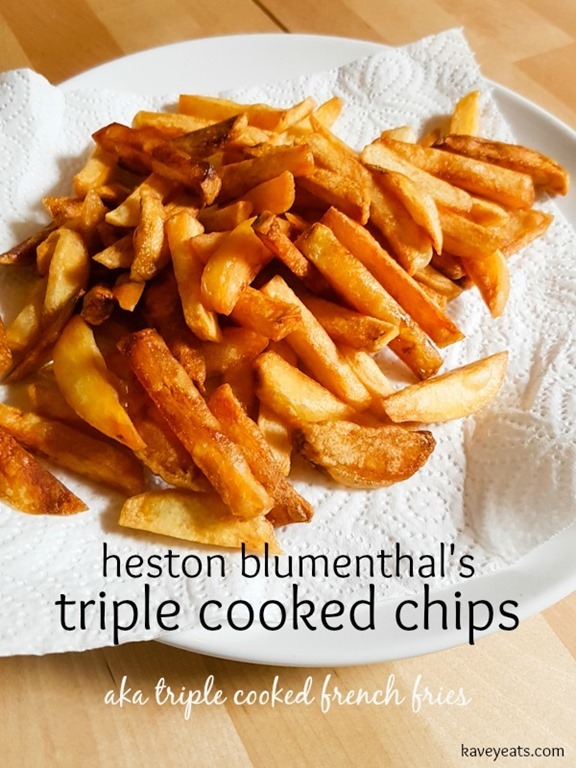 21 Comments to "Heston’s Triple-Cooked Chips"
Love crispy fries when they’re fried to perfection! Sage make the best appliances, I have their no-mess waffle maker and it’s the best! Yeah I love their appliances, not been disappointed by one yet! oh my goodness, triple cooked chips are extra crispy and delicious. This is how it is done. They really are so good! Perfect for appetizer for any party. Yum, so delicious! Potatoes are my favorite! I’ve never seen chips (french fries) served as an appetiser but I guess one could! No reason why not! My weakness… Can’t seem to resist potato chips. Have never heard of Sage appliances but would definitely be on the look out when shopping for appliances. Thanks for sharing!!! It’s a UK brand, and the Heston range they do is particularly good. These triple-cooked chips look amazing. I don’t do deep fat frying, but if I did, I’d have to give these a go. I’ve heard a lot of good things about sage appliances, but haven’t ever tried one myself. We try not to deep fry too often but these are so good, we do enjoy them now and then, particularly with steak or chicken kievs! I don’t have a frier, but I’d be more than happy to come round and test test these for you sometime. I’d like salt on mine and served with either french mustard or tartar sauce. Yes I’m strange that way! I would go for the tartar I think! Mustard, maybe if mixed into mayo? I don’t love the mayo on its own as the Belgians do. I love Marie Rose sauce though! Cool fryer. I’m very much an oven chip sort of girl, as hot fat terrifies me. Something like this makes it simple to deep fry food. I do love triple fried chips and have done since I first tasted them in Belgium in the 1970s! Yeah I was fearful of frying for years because of all that hot oil! But it’s always been fine as we’re careful! Interesting. I’m very familiar with triple cooked chips but we just fry them three times! This is so much more involved. I trust Heston though. He knows his stuff!!! Oh I’ve not come across that before!!! My old fryer packed up and I bought a couple of new ones which were rubbish. We only had one for occasional homemade chips. Thought it was a waste of money and cupboard space but looking at these I’m thinking again. The Sage looks good. I’m definitely finding this one a better design than the old one, though to be fair, it’s about three times more expensive so it’s a case of getting what you pay for. For me, the way you can disassemble, put most of it in the dishwasher, and easily empty the oil are all key features that make this a better model than our cheap old one. I don’t often bother to make triple cooked chips, but on the odd occasion I have, they’ve been soooo good. Some things are worth taking time over!